There’s a very good article by Erik Stokstad at Science magazine covering the recently released independent analysis of the impacts of the Marine Stewardship Council eco-label. The study, Researching the Environmental Impacts of the MSC Certification Programme, is the first to attempt to understand fishery performance through the whole flow of the MSC assessment process. It looked at eight outcome performance indicators: stock status, population reference points, stock recovery, retained species, bycatch species, endangered, threatened and protected (ETP) species, habitats, and ecosystems. 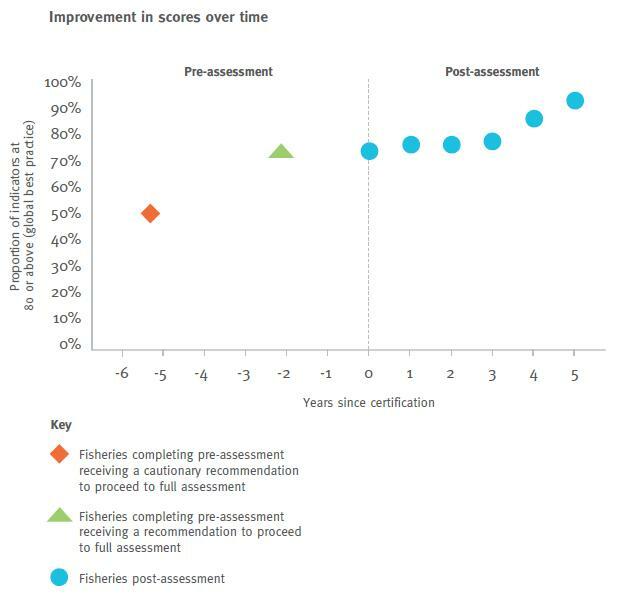 The actual gains [to MSC certification] were more common in protecting fish populations; there was less “on the water” progress in improving the larger ecosystem. And the labeling system seems geared more for industrial operations than smaller fisheries. As I’ve written in the past, there are some clear concerns about the MSC label, so the finding that there is a statistically significant correlation between certification and population health is hugely important news. And I agree with a further conclusion that we have to wait longer to really know the ecosystem wide impacts. The pre- and post-certification samples show that the label leads to better management. Further, it is worth recognizing that the ‘independent’ analysis was conducted by MRAG, Poseidon, and Meridian Prime, all consultancies that have a financial interest in showing that the MSC works. All three are either past or present contractors. I see no reason to question the analysis, but this makes me nervous when there is room for interpretation of the study variables and causality. I think the MSC will have to do a better job at hiring truly independent reviewers in the future. Ultimately, this is a great contribution and I think the start of a more constructive discussion of the merits of the MSC label.